Gwyn Hall is a Grade II listed building with a rich cultural history. The music hall was a gift to the town of Neath in Wales from a wealthy local landowner, Howel Gwyn, and was finally competed eight months after Gwyn’s death in 1888. The hall itself has hosted many famous figures throughout its history that have included Charles Dickens Jr., who performed extracts from his father’s works in the theatre, and more recently the hall was the debut performance venue for Welsh opera singer Katherine Jenkins. Gwyn Hall began a £4m restoration process in 2007, but this was abandoned just months before completion when the building was destroyed by a fire. 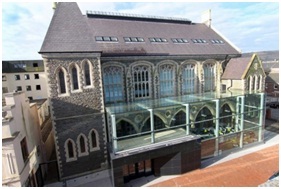 Fortunately, thanks to friends and supporters, Gwyn Hall has undergone a four year redevelopment scheme conducted by Holder Mathias Architects, and its doors finally re-opened in March 2012. Renowned for its durability and striking appearance, Pilkington Planar™ was used to create an elegant glazed extension that adds the wow factor to the new and improved Gwyn Hall. 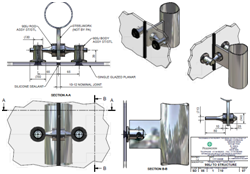 Pilkington Planar™ presents a glass surface which utilises stainless steel fittings to create an attractive flush exterior façade to the structure. The renovation is a sustainable build with natural ventilation; the introduction of a 20 metre-long roof light floods the building with natural light, whilst ensuring that its existing original architecture has a contemporary, crisp, aesthetic edge. Utilising Pilkington Planar™ not only helps create an area that is flooded with light but it also presents architects with the opportunity to use the support system to contribute to the total aesthetic of the building, rather than just using it as a structural requirement. Pilkington Planar™ panels can be attached to glass mullions, steel trusses, tension systems or any combination of the above, ensuring innovative design qualities. Pilkington Planar™ glass can be designed to fit any requirements, enabling architects to build entire structures out of glass, providing design flexibility and the ability to create bright, highly attractive environments with a greater feeling of space. To view a series of case studies featuring Pilkington Planar™ glass, check out our Project References section on our website. Or alternatively, to read more about our extensive range of inspiring glazing solutions, please visit our official website.